Cyclops Salvation is point and click, escape game by abroy. There is no stronger force than love. even for cyclops! One morning Mr. Cyclops discovers that Mrs. Cyclops has been kidnapped by the evil king's infantry. 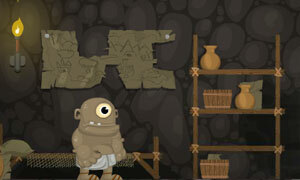 Now it's your job to help the cyclops track down his beloved wife and free her from the wicked soldiers! Good luck and have fun.